I hope you like this minimalist look! i love it dear. floral pants are wonderful! Your trousers are so beautiful! Shoes and pants are fantastic! a truly beautiful ensemble. An ode to minimal floral indeed with a light touch of southern Italy flair! Gorgeous setting as well! Your floral pants are so pretty. Love your shirt and cardigan too. It’s a very nice outfit. Perfect photos. Beautiful, I love the addition of the red pumps! Lindo o look … Calça maravilhosa!!! i have the same pair of pants and you definitely inspired me on how to style them! El clutch y los zapatos…me han encantado! Oooh, you super chic pretty thang! I love this look with the floral pants – so different from the other look. Also noticed you broke out the pink pants in the previous post! Me? I’m doing the hot pink top thang! I really love the way you’ve styled this. I’m loving the floral pants and my favorite way to wear them is with clean basics. So gorgeous!! I really love your style and floreal pants are amazing!!!! So chic! I love the tourers paired with the red pumps. what a sleek and bold outfit!! Hello Veronica I like your panst. Kiss. Great look! 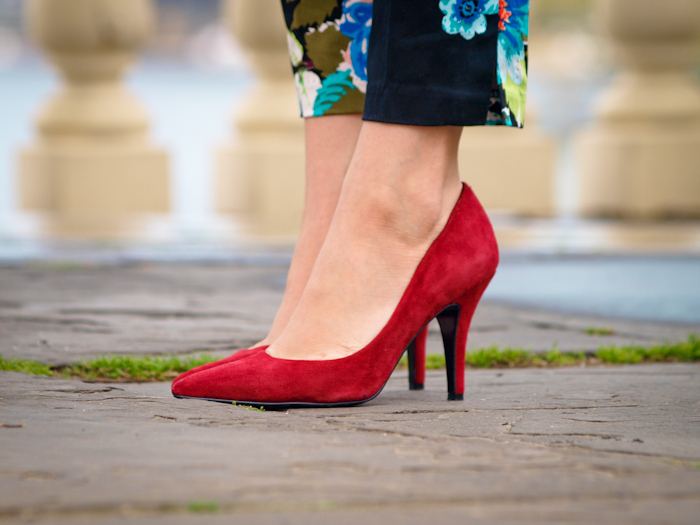 Love your pumps! Wow, I love this outfit and I love how you added some understatement to these “bright floral pants” ;-) Wonderful outfit! Love how you styled the floral pants, and the red shoes are just amazing. I totally heart the floral pants….screams summer! WOW! look at you! I love this outfit, and the minimalist approach to the floral trend, those pants are TDF!